Willingham by Stow Village Hall was built in 1913 and stands in the centre of the village on the High Street opposite The Half Moon Public House.The building offers a wide range of facilities for residents of the village and the surrounding area. There is a large main hall, with stage and lighting, which can seat up to 80 people, a modern kitchen, with sufficient place settings, cutlery, crockery etc for any function, a meeting room which can incorporate a bar, toilets (including disabled facilities) plus a ramp and steps giving access to the front doors. It has been decided that the General Committee will continue to have overall responsibility for the running of the Village Hall, however, in order to make day to day management easier, a separate management Committee has been established. If you have any suggestions for functions, fund raising activities, improvements to the hall or facilities or has any special skills which could be volunteered, please feel free to contact any member of the committee with your ideas. The 150 Club is now well established and not only offers three, monthly prizes, but also helps with our fund raising. If you would like to join, please contact any of the committee members. Special Occasion? Birthday? Anniversary? Christening? 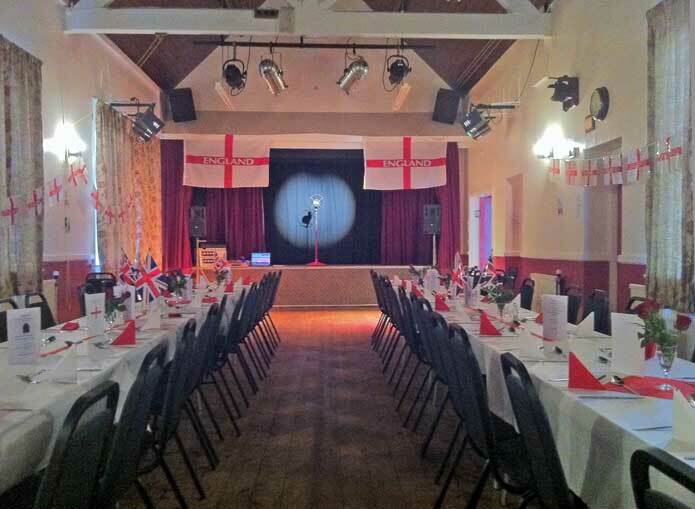 The Village Hall is available for hire at very reasonable rates. Catering and Licensed Bar are available (Hirers to arrange) Please contact any member of the committee. All the clubs and groups who regularly use the hall will continue to be represented and this committee will have overall responsibility for the village hall. Some organisations take a summer break. On these occasions the village hall becomes available for hire.